The Filarmonica Gioachino Rossini Orchestra (FGR Orchestra) was established through the commitment of several musicians boasting a flourishing artistic career both at national and international levels. It first performed in Pesaro on February 21st, 2014, at the G. Rossini Conservatory “Pedrotti” Auditorium, quickly acquiring distinguished recognitions from the audience and the critics. The Filarmonica Gioachino Rossini identifies with a quality project, with deep roots in Rossini’s birthplace, and it intends to explore all of the aspects and possibilities through which the musical culture of a territory is expressed and developed with the objective of spreading its name, together with that of its homeland in the most important international cultural circuits. The FGR supports the concept of music as an introduction to beauty and creativity and the idea that perfection and talent are gained through commitment and diligence. The FGR has built its mission on these guidelines, giving great value to music as moment of training, confrontation and sharing. President of the FGR Orchestra is Michele Antonelli, Art Director and FGR Quality and Identity Manager. He is responsible for the players, planning and special projects conception. The FGR started performing with a contribution to civil engagement, participating at the World Day against Child Labour organized and proclaimed by the I.L.O. (International Labour Organization) in June 2014. The Orchestra made its début at the Rossini Opera Festival 2014 with the opera “The Journey to Reims” and a lyric symphony recital with contralto Ewa Podles. An invitation from the distinguished DECCA recording company (Universal Music Group) to record a CD with tenor Juan Diego Florez – devoted to traditional Italian songs and Rossini’s repertoire – is proof of the prestigious esteem the Orchestra has gained in such a short period of time. The CD, released in September 2015, has already been greatly appreciated. Meanwhile, an important artistic cooperation has taken place with orchestra conductor Donato Renzetti, who, appreciating the high artistic level of the FGR Orchestra, has decided to foster – with the great prestige that his conduction can grant – the image of the newborn Filarmonica Gioachino Rossini. In February 2015 began the several years’ cooperation between the FGR and Verona’s Peter Maag Fund for the realization of Peter Maag’s “La Bottega”, a renowned opera workshop created and established by the great Swiss orchestra conductor, who died in recent years. The Filarmonica Gioachino Rossini therefore has become the orchestra of Peter Maag’s “La Bottega”, a project which has moved from Verona to Pesaro, making the town the permanent home for its courses, stages and masterclasses. The three-year project includes the study and the performance of Mozarts’ three operas according to libretto by Lorenzo Da Ponte, “The Marriage of Figaro”– “Don Giovanni”– “Cosi fan tutte”, and the in-depth study of symphony repertoires (the cycle of Beethoven’s nine Symphonies). Key player of this project – together with the FGR – is Donato Renzetti, who, since June 2015, has become the Chief Conductor of the Filarmonica Gioachino Rossini Orchestra. Drawing on his past experiences, Maestro Renzetti has taken up a new outstanding artistic journey, and in cooperation with the FGR he has created “DR-records”, aiming at performing and recording new versions and unpublished works of the most important pages of the symphonic repertoire. The first project that DR-records intends to set up is the full performance, in critical edition by Fondazione Rossini di Pesaro, of Gioachino Rossini’s Ouvertures. The project is divided in four subsequent phases: the first took place at the end of December 2015, the second one in June 2016, the third one in October and the fourth one in December 2016. The FGR held his international début in July 2015 at Beiteddine Art Festival in Beirut (Lebanon) together with renowned tenor Juan Diego Florez and Lebanese soprano Joyce El Khoury. Within the same programme of Beiteddine Festival, the FGR accompanied the famous soprano Anna Netrebko, on August 27th. In 2016 the FGR performed with Juan Diego Florez at the London Royal Albert Hall for the Rosenblatt Recitals Series, on March 29th. Then with Donato Renzetti, within an outstanding tour called “Rossini in Viaggio” (Rossini on tour) focusing on the composer’s Symphonies, in June and in October, the Orchestra performed in Pesaro (at the Conservatory’s Auditorium Pedrotti, on the occasion of the European Music Day 2016), in Milan (at Sala Verdi of the Conservatory and at Carcano Theatre), Udine (Villa Manin), Salzburg (at the great hall of Mozarteum), Venice (at Scuola Grande di San Rocco), Rome (Olympic Theatre) and in Lanciano. The FGR has also performed in Pesaro, for the programme of Ente Concerti di Pesaro. Within an educational approach, the FGR cooperated, in May 2016, to the project “Sinfonia por el Perù” together with Istituto Comprensivo Don Gaudiano di Pesaro, a music-oriented school. Involving students from the school, they performed the Melologue for Speaking Voice, Chamber Orchestra, Orchestra and Young Choir called “The Legend of the two mountains” of Pesaro composer Mario Totario, at the Rossini Theatre. 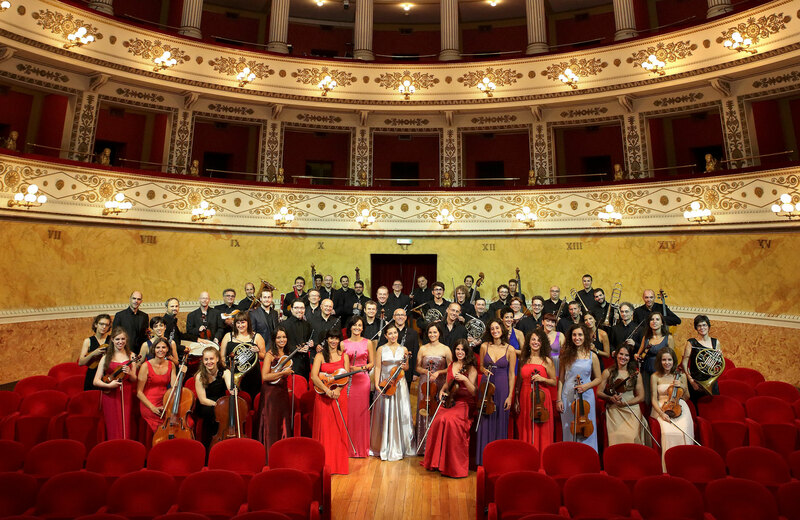 The Orchestra has been participating at Rossini Opera Festival since 2014. In 2015, FGR performed “Il Viaggio a Reims” (with Rossini Academy interpreters) and “Messa di Gloria” (tenor Juan Diego Florez and soprano Jessica Pratt), in 2016, “Il Turco in Italia”, under the conduction of Speranza Scappucci, in 2017 “Il Viaggio a Reims” and two lyric symphony recitals under the conduction of David Parry and Ivan Lopez Reynoso with tenors Michael Spyres, Sergej Romanovsky and John Irvin, and the famous bass Ildar Abdrazakov. The Filarmonica Gioachino Rossini certainly is one of the most interesting new realities at a national and international level and stands out as an ambassador of Gioachino Rossini’s compositions – The Swan of Pesaro.